By this point in January, you’re either sticking to your New Year’s fitness resolutions or you’ve given up on them altogether. 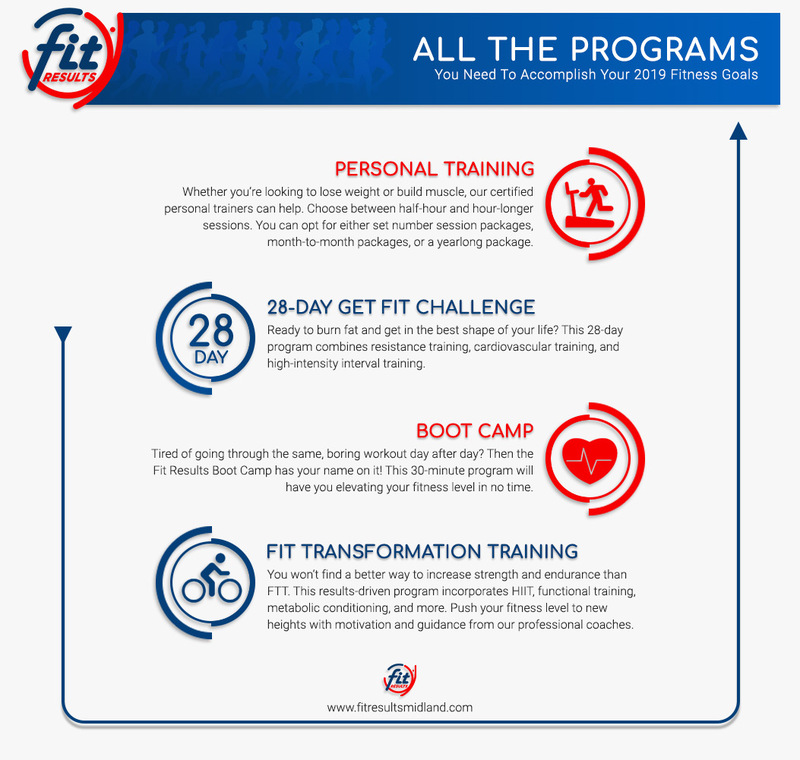 At Fit Results Inc., we’re here to tell you that you can get back on track toward achieving those goals. All it takes is breaking them down into smaller, more manageable milestones and avoiding an intimidating, “big picture” mindset. “I want to get back in shape in 2019.” We can’t tell you how often we’ve already heard this blanket statement in the new year. 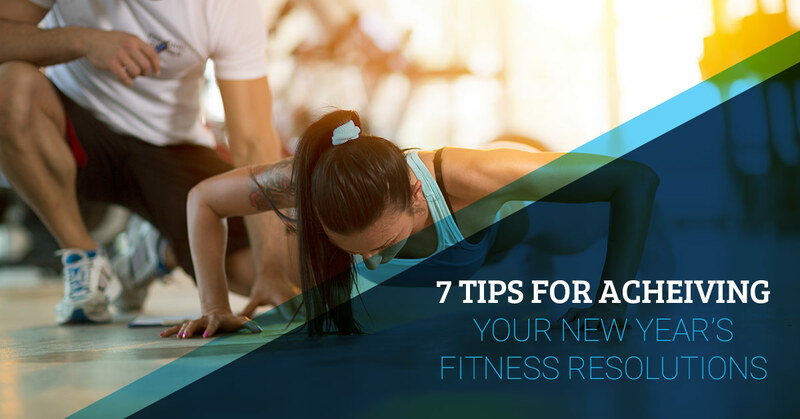 If you really want to take your fitness to the next level and take charge of your life, it’s imperative to create goals that are specific, measureable, achievable, and time-bound (SMART). Let’s look at an example. Perhaps you want to shed a few pounds but want to hold yourself accountable in the process. However, “a few” isn’t measurable and, unless you want to set yourself up for failure, losing 50 pounds by the summer isn’t achievable. You get the idea here. What good is setting a fitness goal if you aren’t going to track your progress? Should you not measure your efforts, you’ll probably end up going through the motions during workouts and then putting your resolutions on the backburner at some point. Think of tracking your progress as getting a routine checkup. If you measure what you’ve done and don’t like the results, it’s time to make an adjustment. The same idea holds true if you are, in fact, on track with your fitness goals. Once you feel as though you’re hitting a plateau, go ahead and re-evaluate the plan. Rarely is getting fit a cakewalk. As you embark on this journey, know that there will undoubtedly be a fair share of highs and lows. If you’re focused on losing weight, don’t be surprised if you’re down several pounds one week and then up a couple the next. The point with this one is that lasting changes take time. Remember that fitness isn’t just about hitting the gym after work and calling it good. It probably also means making some dietary changes and taking up a more active lifestyle at home. In any case, don’t expect immediate results. Trust us when we say your hard work and dedication pays off in the long haul. 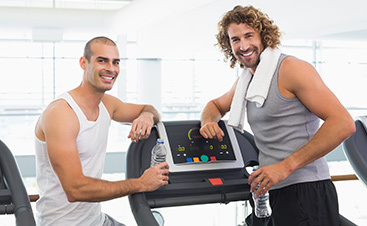 We are often reluctant to share our fitness goals and understandably so. The thought of failing makes us both vulnerable and uneasy. All that aside, your odds of success dramatically increase when you have the support of loved ones. This is where having a fitness partner or “workout buddy” enters the equation. Sure, you may not want to go to the gym after a long day at the office. But the last thing you want to do is disappoint your accountability partner after the number of times they were there for you. Part of why fitness resolutions fail is because people claim to “not have time” to exercise. Rather than go on a run or bike ride, they choose to stay at the office an hour longer or make other plans instead. Don’t fall into this trap! Here at Fit Results, we recommend scheduling your workouts into your calendar. Think about it — you probably aren’t going to reschedule a doctor’s appointment unless something comes up at the last minute. You should have the same mindset when it comes to maintaining a fitness regimen. Unless there’s a family emergency or you absolutely have to stay late at the office, you can probably block out an hour to get a workout in. It’s easy to get caught up in all-or-nothing thinking as you work toward your fitness goals. While you certainly want to remain motivated, be careful so that you don’t get burned out. It’s okay to recognize the mini milestones, even if they seem trivial. Let’s consider another example. You had a painfully long day at the office and all you want to do is head home and binge your favorite Netflix shows. But then you remember you’ve worked out every day for several weeks now and you don’t want that streak to end. So you make the decision to go to the gym for 30 minutes instead of an hour. Not only does your workout streak continue, but you still have an extra 30 minutes of relaxing at home. We’d say this qualifies as a victory — and it’s definitely worth celebrating. Maybe you’ve tried the aforementioned tips but to no avail. 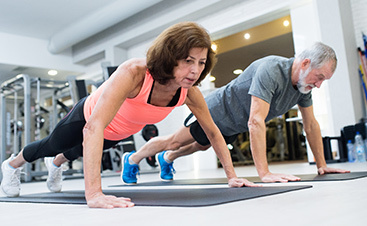 Our last piece of advice for achieving your New Year’s fitness resolutions is to find a personal trainer. Not only is a personal trainer the ideal support system, but he or she is qualified to create a workout plan based on your specific goals. 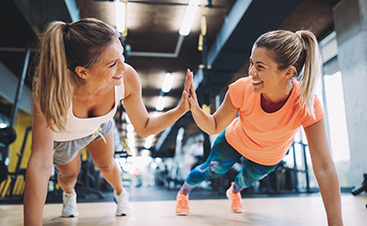 It’s time to take new, more sound approach to your fitness goals in 2019. Contact Fit Results today.